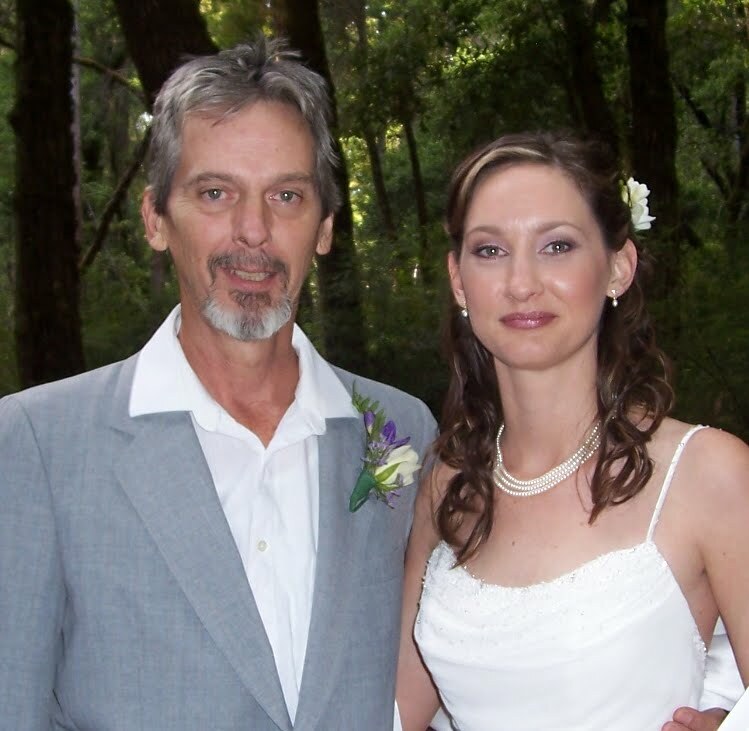 My dad passed away unexpectedly a few days before this Christmas. I’m grief stricken. I am relieved that he is no longer in pain though and am trying to work through all of the memories that I want to keep. 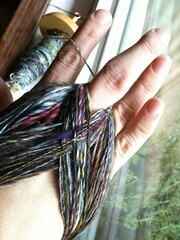 Working with yarn is proving to be very comforting and theraputic. 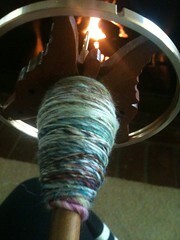 I got a Golding Drop Spindle from my husband this year, the day after I learned the news. 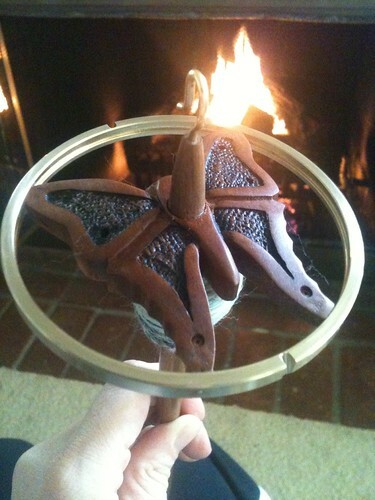 Fittingly, it is butterfly. I’m hoping to capture the best parts of him in this spinning process. Really, I’m hoping to spin the memories like threads into this yarn waiting to be knit up into something special to keep me warm, keep the good memories alive, and help resolve the loss that I feel. I’ll put captions on the pictures for those who want to see the spinning process, you can skip through the long post and just read the captions. 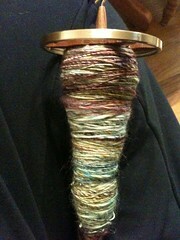 The colors in this yarn are green and blue with purple and brown and gold mixed in. As I spun the single ply, I thought of my dad’s eyes, which he passed on to me. The colors remind me of the ocean, which he always loved and so did I. I remember him taking me way out in the ocean past the breaking waves when I was in grade school. I was scared, but felt so safe in his arms. He taught me how to dive down deep to the ocean floor when a big wave was coming so that I could come up safely behind it and avoid it crashing over me. I loved that feeling. He passed on the gift of working with his hands… a true handy man. He worked construction and could do some really great work back before his disease really set in. I have his hands. I’m sure that’s why I love to work with yarn. 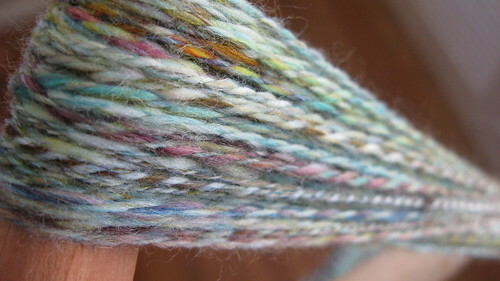 As I plied this yarn I thought of him teaching me to change a tire, set up the home audio/video equipment (which I am in charge of at home to this day), Tinkering with his Apple I computer. He actually drilled holes in the side of it and jerry-rigged an external fan. When he turned it on the image on the screen would wave like a flag… but it stopped overheating! I learned to play piano on that thing, with his keyboard that he had hooked up for his music studio and some apple software. He was part of the reason I was exposed to computers early on, and probably why I’m in the tech field today. After plying, I loaded the yarn onto the niddy noddy (for those non-spinners, a niddy noddy measures out your yarn yardage and allows the twist energy to settle in). 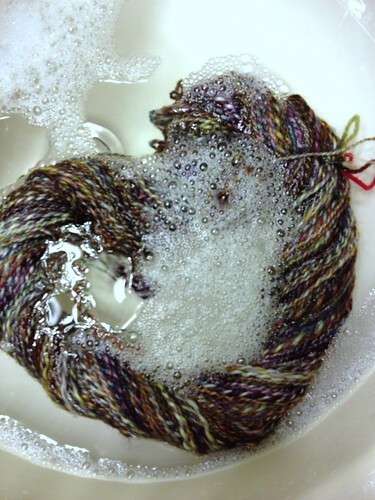 I let it sit for a day and then set the twist with a good soak in tepid water with a little lavendar scented wool-friendly soap. I thought about him teaching me to shoot a basket ball, play tennis, play softball, love bowling (I have my own ball and shoes!) and teach me the rules to football. He loved sports. We had so much fun. After soaking I pressed the water out with a towel as best I could and hung it by the window to dry over night. I thought about how we loved to play music together. He is the reason I played flute for so many years. I love you dad. 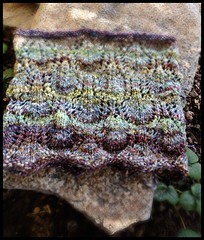 I will keep the good memories alive and feel a hug from you each time I wear the cowl that I made with this yarn. That is an awesome photo of you two. I love your thoughts of him and how you work them into your spinning. 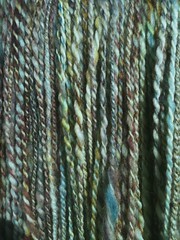 To create this beautiful yarn with the memories of your Dad is a great way for you to enter your healing journey. That drop spindle is a work of art. I am so sorry to hear about your father. It actually occurred to me that something considerable had happened to keep you out of the loop, but I think it is wonderful that spinning is helping you to cope with your grief. Your father sounded like a remarkable man and seems to have contributed a great deal to the unique person that you have become–love of the ocean and computers, learning of the piano and flute and basketball, tennis, softball and bowling. And I am sure he passed along a great many more attributes that you lacked the time and space to mention. But how marvelous–almost all through the work of his hands! Thank you for this endearing post! Sharon, I feel your pain, as my father passed away on Christmas day 2010. I'm glad you have great memories of him and are honoring him with your work. I'm also sorry for your loss. Life is a cycle and I think he would love that what you love to do becomes a way to remember him. Your Dad and I were friends, room mates and fellow musicians. He loved you dearly and I still remember the song that bears your name. I don’t know the details of his passing, but I do know where he went. He is still as proud as ever and watching over you for sure. What you are doing is a fitting tribute to John and the things you both shared. Hi David, I remember your name. Thanks for the kind words.